If the very idea of sitting down for a feature-length film about slime mould seems absurd, then you really should take a look at Tim Grabham and Jasper Sharp's enthralling documentary, THE CREEPING GARDEN. Slarek is bewitched by the film, its subject matter, and Arrow Academy's superb dual format release. "Not animal, not vegetable, not fungi... slime mould." If selling a concept for a movie to people with their fingers tightly grasped around the purse strings of potential funding can sometimes be based on a brief one-line description, I can think of few who must have faced a bigger uphill struggle than co-directors Tim Grabham and Midnight Eye co-founder and writer Jasper Sharp when they first tabled the idea of making a feature-length documentary about slime mould. This is, after all, not something that most would regard as feature film material, more the subject for an episode of the science-themed BBC TV series Horizon. And as a feature it will be required to earn its cost back primarily on a pay-per-view basis, and even the most philanthropic moneyman is thus going to have a few serious questions about the size of the film's potential audience. So, full marks to Grabham and Sharp, who from what I can gather ended up funding and shooting the project themselves as a largely two-man team over the course of three or four years, for sticking to their plan to deliver a fully-fledged feature rather than trying to cut a deal with a sympathetic TV station. Which is all well and fine, but how does the result of their considerable time and effort play as a film? The basic building blocks are certainly no different to those of even a half-decent TV science documentary, consisting as they do of an unhurried blend of name-and-job-captioned interviews, location and studio nature photography, archive material, computer generated imagery, and footage of the participants at work or presenting materials and demonstrating equipment. And remember, it's a film about slime mould. Sold on the idea of watching it yet? No? Well, let's see if I can convince you to give it a go. You can thank me later. Unlikely though it may seem, the principal hook here is slime mould itself, whose existence I'm willing to bet that a good many of you were not even aware of. I certainly wasn't. Regular mould (if there is such a thing – I'm sure biologists everywhere just let out a collective groan) is something we're all doubtless familiar with, whether it be the sort that grows on that dodgy bit of sealant at the base of the shower or the colourful spots that decorate that piece of cheese that's been sitting unnoticed at the back of the fridge for six months. Slime mould is a little more special, not just in appearance – some strains are strikingly colourful, while others look almost like sea anemone – but also in some of the specifics of its behaviour, although you'll need to accelerate the passing of time to see and appreciate this. Do so and something extraordinary is revealed, single-cell organisms that work as collectives, pulsating in a manner that seems to emulate breathing or the workings of a circulatory system, while their ability to seek out and locate food even in constructed mazes suggests a rudimentary intelligence, which led to them once being categorised as animals. Grabham and Sharp explore the nature of slime moulds from a number of interesting angles, each of which subtly feed into and compliment the others. There's amateur mycologist Mike Pragnell, who wanders the woodland with his camera in search of sometimes hidden-away strains of the organism. There's Bryn Dentinger, who, as Head of Mycology at Kew's Royal Botanic Gardens, is well versed in the history of scientific research into what we learn has been around for something like 40 million years. And there's Tim Boon, author of Films of Fact: A History of Science in Documentary Films and Television, who delivers a fascinating aside on early biological magic lantern shows and introduces us to the work of pioneering biological filmmaker F. Percy Smith, himself the subject of an upcoming BFI dual format release. Yet despite the subject matter, it's not all about biological science. Take artist Heather Barnett, whose work is directly inspired by the appearance and behaviour of slime moulds, and whose earlier pieces include visually arresting wallpaper whose patterning is drawn from the cellular structure of medical smears. And what about Professor Andy Adamatzky from the wonderfully named Centre for Unconventional Computing at the University of the West of England in Bristol, whose experiments include one in which slime mould is able to map cross-country road networks. And let's not forget Professor Eduardo R. Miranda, the Head of Interdisciplinary Centre for Computer Music Research at Plymouth University, who uses slime moulds to trigger electromagnets positioned above piano strings to create experimental music. Others use the moulds to generate expressions on a robotic face or prompt a small biocomputer vehicle to change direction, experiments whose future development potential is only hinted at here. All of which is fascinating in its own right, but what makes The Creeping Garden stand apart from the TV documentaries to which I superficially compared it above lies very much in Grabham and Sharp's approach, which draws on a number of stylistic tropes from science fiction cinema to lend the subject a seductive otherworldly quality. This is most evident in their extraordinary time-lapse footage of the slime moulds, which has the effect of transforming them into alien creatures, pulsing with seemingly malevolent intent, relentlessly tracking down and engulfing nearby sources of food, and extending tendrils in a discomfortingly predatory manner. This is all neatly underscored by Jim O'Rourke's sometimes ethereal and occasionally sinister electronic music score and Grabham's own carefully composed scope cinematography, and even the font used for the captions and titles feels more in tune with The Andromeda Strain than the more conservatively traditionalist documentary norm. On their commentary track, directors Grabham and Sharp briefly discuss the concept and importance of what they call the niche documentary, a concept that their enthralling film makes a most persuasive case for. If the prime purpose of any documentary worth its salt is to educate its audience in a manner that enthrals as well as informs, then The Creeping Garden qualifies and then some. It takes an organism that few will likely be aware of and explores it in a number of disparate but almost always captivating ways (only the stand-back-and-watch coverage of an experiment at a Rotterdam conference in which volunteers are tied together in an attempt to emulate the behaviour of slime moulds failed to hook me), and while those with some foreknowledge of the subject might gripe at a perceived lack of scientific depth, as an imaginative and revealing window into the nature and behaviour of this strange but utterly intriguing organism, The Creeping Garden really delivers. Shot digitally in HD on unspecified equipment, the 2.35:1 1080p image on the Blu-ray in this dual-format set is – with a couple of very brief exceptions when the focus is a tad soft – as close to pristine as you could wish for. This flatters Grabham and Sharp's decision to keep the camera locked down and to restrict movements to slow pans, tilts and tracks, and really enables the time-lapse material to shine, particularly those captured in the studio where the filmmakers did not have to rely on the cooperation of nature for their lighting. The contrast is perfectly pitched and the colour is pleasingly naturalistic, with no annoying games played with the palette in post-production to overplay the link to science fiction cinema. Excellent. The Linear PCM 2.0 stereo track is equally impressive, capturing each element with crystal clarity in a mix in which the music enhances and underscores the visuals and the interview material without ever dominating or competing with it. It you do redirect the lower frequencies through the subwoofer (which purists and perhaps also the filmmakers might baulk at), the score delivers some wonderfully sinister bass notes. A short piece that expands on Professor Eduardo R. Miranda's use of slime mould to trigger electromagnets fitted above piano strings to create an avant-garde composition, one that is ultimately performed for an admittedly small but politely appreciative audience. Essentially two deleted scenes from the film's Fungarium sequence, one involving bone-eating fungi on a sheep's skull, the other featuring one of the biggest mushrooms you're ever likely to have seen. This brought back some memories for me, as several years ago I photographed mushrooms this size in their fresh state before they were cooked and eaten. Frustratingly, due to other commitments, I never got to taste them. Professor Andy Adamatzky reveals some of the specifics of a slime mould's preferred diet. We learn that it hates alcohol, but when offered cannabis, tobacco and oat flakes in the same petri dish, it will try the first two before settling on the third. Are we sure this isn't an animal? The section cinema iloobia Short Films includes three short films by Tim Grabham that either informed or were offshoots from The Creeping Garden. An influence on visual-audio approach of the main feature, this 2009 experimental short sees the dropping of milk into a glass of oil transformed into mesmerising animated globular abstractions. An influence also on the visual-audio effects of the feature, this 2012 avant-garde short is comprised of macro close-up shots of a garden snail, which have been further abstracted by recording the images onto VHS tape and them converting them to digital, creating the sense that we're looking at something undefined and monstrous, a response the soundtrack does its best to encourage. A straightforwardly presented but fascinating short about a project led by composer Eduardo Reck Miranda that enables those with severe motor-impairment to create music. It includes a public performance of the finished composition, and the reactions of the participants tells you all you need to know about the remarkable nature and impact of the project. The film's closing title sequence, which is comprised of animated illustrations of slime mould by biological illustrator Angela Mele and is scored by Woob (aka Paul Frankland), playing here without the credits to enable you to better appreciate the imagery. A manually advanced collection of posters and production stills, some of which look suspiciously like screen grabs from the film, plus photos of a number of slime mould samples. A short trailer that tells you next to nothing. A most engagingly chatty commentary with producer-directors Tim Grabham and Jasper Sharp, who reveal early on just how long it took to bring the film together and how intimate a production it became. I was intrigued to learn that they discovered the potential for shooting time-lapse footage of the slime moulds after scrubbing rapidly through a long-held shot of one of them on the editing bench and noticing the movement, and I appreciated the background information provided on the shooting of individual sequences and the various participants. The accompanying book by Sharp and Grabham gets some tantalising coverage, and we learn that the pair had to fork out to a couple of EastJet tickets to get the Rotterdam footage, but couldn't stretch to flights to America and Japan to procure other interviews they wanted. There's loads more here, all of it worth hearing. A fine accompaniment to the film. If you've ever fancied transforming everyday chores like cooking, washing-up or even writing reviews into scenes from an unsettling science fiction movie, then this soundtrack CD – which is exclusive to the Limited Edition – is definitely for you. Here composer Tim O'Rourke has combined his musical contributions to the film into two tracks, which run for just shy of 18 minutes apiece. Alternately seductive, unsettling, soothing and disturbing, it makes for an entrancing if occasionally discomforting listen, and is far preferable to those music and effects only tracks that we tend to be so casually dismissive of. Also included with the Limited Edition release is an Illustrated Collector's Booklet containing writing on the film by Jasper Sharp, which was not available for review. 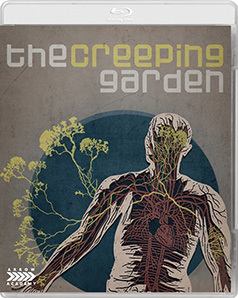 The Creeping Garden is not the easiest sell I've encountered this year, but I'd seriously suggest shelving any apprehension you may have about sitting down for a film about plasmodial mould (man, even writing that makes me wonder how many raised eyebrows and forced grins the directors must have encountered when trying to get the film funded and distributed) and surrender instead to what for what is one of the most unexpectedly bewitching documentary features I've watched in some time. Great transfer, a terrific collection of special features, and if you get the Limited Edition (and you should) then you also get a bonus CD and what I've no doubt at all will be a fine booklet. Highly recommended.